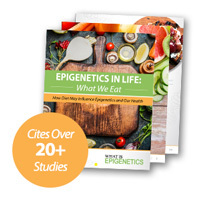 Being Overweight Adds Distinct Epigenetic Marks to DNA | What is Epigenetics? Extra weight that you may have put on during the holidays could not only appear around your belly, but also add epigenetic tags to your DNA, suggests a new study. Having a high body mass index (BMI) was linked to additional methyl tags found at more than 200 areas on the genome, which affects gene expression and could predict susceptibility to some diseases like diabetes. A team of international scientists looked at the connection between BMI and the epigenetic mark known as DNA methylation. They used state-of-the-art technology to carry out one of the largest studies on the subject to-date, according to the researchers. Previous studies have found that epigenetics may also have a hand in determining whether a person will become fat or lean in life, due to an epigenetic “obesity switch” being turned on or off. Common chemicals, such as phthalates found in plastics, have also been found to play a role in epigenetically programming someone for obesity by tipping the “epigenetic balance” of stem cells toward adipogenesis, or fat formation. What’s perhaps even more intriguing is that our parents’ weight may epigenetically contribute to our risk of disease even before we’re born. In this study, the epigenetic signature in blood from more than 10,000 European men and women was examined. In a first group of over 5,300 samples, the team found that 207 gene loci showed an epigenetic change associated with BMI. Then, 187 of these candidate loci were confirmed in blood and adipose tissue in a secondary group of nearly 5,000 samples. “In particular, significant changes were found in the expression of genes responsible for lipid metabolism and substrate transport, but inflammation-related gene loci were also affected,” said Harald Grallert, leader of the research group. They also pinpointed some epigenetic markers that predicted the risk of developing type 2 diabetes. With all association studies, it is difficult to determine whether the relationship is causal. In light of long-term observations and additional tests, however, the researchers showed that the epigenetic changes occurred as a result of being overweight. “Genetic association analyses demonstrate that the alterations in DNA methylation are predominantly the consequence of adiposity, rather than the cause,” the group reported. Overall, their data show how signaling pathways are impacted by obesity, and, according to the head of the AME, Christian Gieger, their study might help predict and potentially prevent type 2 diabetes. For a future direction, the researchers hope to eventually translate their findings into new prevention and treatment strategies for diabetes, enhancing human health and wellbeing. Reference: Overweight Affects DNA Methylation. Helmholtz Zentrum München.22 Dec 2016. Web.